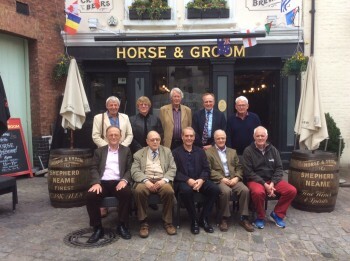 The first reunion of the 1960 (summer) Prefects’ Room was the 50th, in 2010, following the precedent set the previous year by the 1959 prefects (who have also had their 55th). All these reunions, and others held by the prefects of subsequent years, have taken place at the same tavern, which is quiet, easy to reach, and highly hospitable under the genial and generous management of Aiden Ganly. In both cases the turn-out for the 55th was smaller than that for the 50th; in the case of the 1960 group, all 21 survivors came along in 2010 – sadly, one of our number was by then too unwell to attend and has subsequently died – whereas this year ill-health prevented two from coming and others had other commitments. It is notable that John Higham (OW 1953-60) and Robert Kibble (OW 1953-62) both came from California, Tim Forbes (OW 1955-60) from New Zealand and Stephen Potter (OW 1952-59) from France, so the need to travel was not a deterrent. No fewer than four of those present had also been in the 1959 room and attended both that year’s reunions. For the 50th anniversary meeting those attending had prepared in advance brief summaries of their lives since leaving school. These were not updated for the 55th (since it seemed that most people’s lives had not changed that much) but it did not take long for any new developments to be described. Several of those present were still economically active, while others had embraced retirement with gusto. There were, inevitably, reminiscences about life and characters at Haling Park, nearly all recounted with pleasure and approval of our alma mater. At the conclusion of the lunch, before we all departed, we discussed “the next time”, and there was general, if slightly pessimistic, agreement that our 60th anniversary was too long to wait. So we hope that Aiden will still be there to welcome us in 2018.